Ever since we've come back from our Christmas holiday in Greece, I've been thinking of our lovely lunch at the trout farms in Planitero, amongst the Peloponnese mountains. 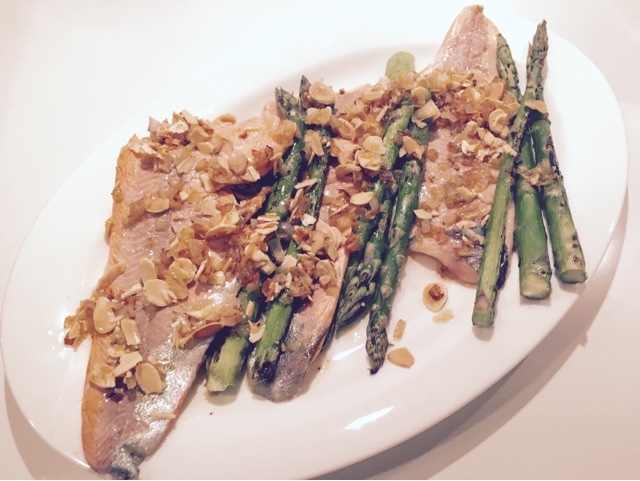 We try to eat fish twice a week and I've wanted to re-create this lovely dish: trout with almonds. Their version is a bit more rustic, you get the whole fish, with big chunks of roasted almonds. Luckily trout is widely available in British supermarkets and it's quite affordable too. 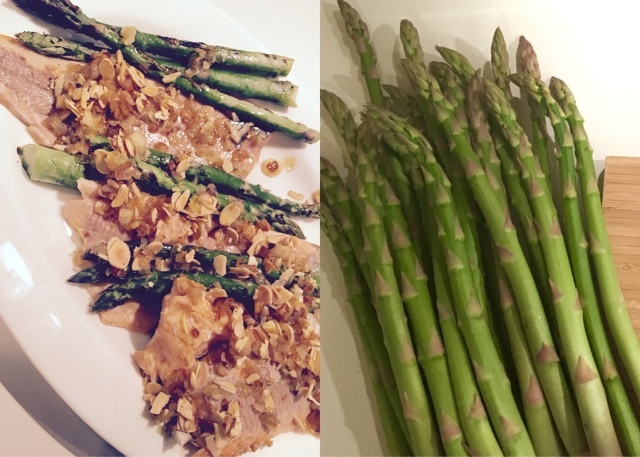 My version is lighter, with delicate flavours, so I decided to serve it with asparagus and three-ice cooked new potatoes. No, I wasn't going for the chef-y "Heston's three-ice cooked fries" kind of thing, it just happened and it was delicious! I used our new Le Creuset griddle pan for all this, but you can use a big non-stick pan instead. We are in love with our griddle pan so any excuse to use it, really! Truth be told, I was worried that we are running out of space in our kitchen hence we were putting off buying it for a long time, but I store it standing, next to the chopping boards so it's not so bad after all. And the effect of cooking meat or fish on the griddle pan makes everything twice as nice: smoky flavours and those griddle lines, to please the eye! We opened a bottle of Assyrtiko white wine, it's light and smooth, perfect for this dish. Assyrtiko, is a grape variety growing on Santorini's volcanic ground, with little water and plenty of sunshine, a lovely combination! This is all very quick, so get everything out of the fridge beforehand. Trout is quite sticky, give it a good wash and pat dry it with some kitchen towel. Put the potatoes to boil in water, for 10- 12 minutes, depending on the size. Don't over-cook them, pierce one with a fork to see if it's cooked all the way. If you find no resistance, they are ready. Drain them and keep them aside. If you are using a griddle pan, put it on the hob and switch the heat on medium. Let it warm up. In a small saucepan melt the butter with the olive oil. The olive oil prevents the butter from burning too quickly. Add the chopped shallots and cook for 3-4 minutes on medium heat. You want them to soften, not get crispy and burn. When they are golden, add the flaked almonds, cook for another minute and switch off the heat completely. While you are waiting for the shallots to soften, put the trout fillets skin-side down, on the griddle pan. At this stage you can also arrange some of the asparagus and new potatoes on the other side of the griddle pan. Keep the heat medium to low on the side of the trout, it only takes 4 minutes; then with a spatula turn the trout fillets over. It's quite flaky, so be gentle with it! I said be gentle, not be a wuss! Keep turning the asparagus, too. 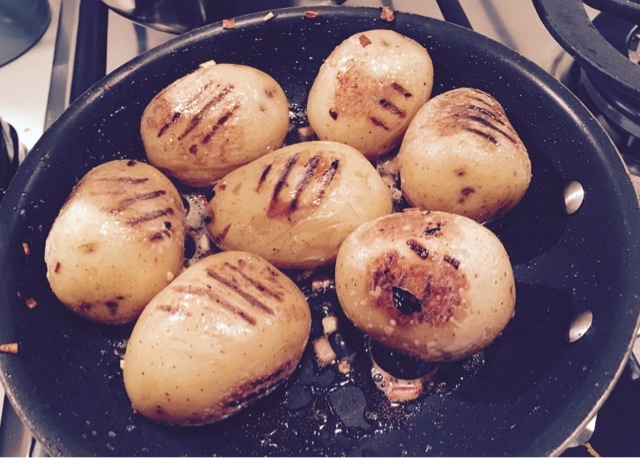 The potatoes only need turning once, to get those lovely griddle lines, they are already cooked. 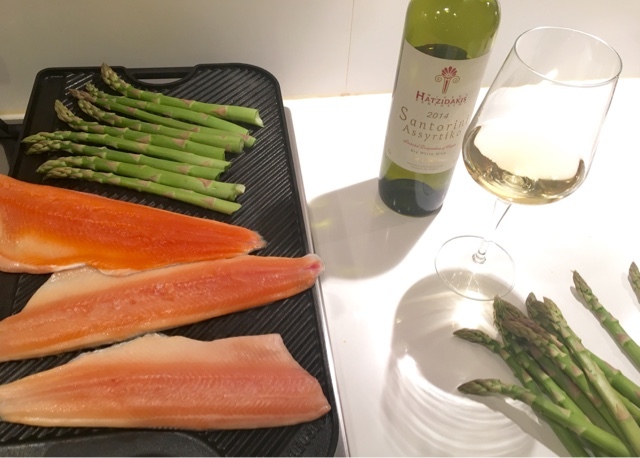 Once the trout has had another 2 minutes on the other side, move the fillets on to a serving dish, along with the asparagus. Cover them in the buttery almonds and sprinkle with some salt and pepper right at the end. Toss the new potatoes in the saucepan with the leftover butter and almonds. Salt & pepper.